We are all aware that we are energy vibrating at a frequency, that said that energy holds a number of aspects, two to be exact, a masculine and feminine aspect. These aspects are presented to us in our current level of reality, the purpose of which is to aid us in living in a duality existence. On shifting higher up that dimensional frequency level, these aspects with become unified and one. By acknowledging each aspect individually this will help us understand the impact and cruical part they play in our life. Regardless of our physical gender, we all hold both aspects, this is reflected in our physical body when we look at the brain and the heart. Both of these organs play a massive part in how we operate, not just on a physical biological level, but on a meta physical energetic level. The power of the heart - brain coherence is a truly fascinating subject on its own and won't be discussed in this blog, but it's definitely worth a mention and further investigation maybe shared at a later time. So from a physical perspective we can see that both our brain and heart have a right and left side, each side is responsible for differing function. For example; Our left brain is responsible for our rational mind, our logical thinking and for putting thought into action, our right brain is responsible for our creativity, our intuition and allows us the inspiration to be inspired. We can see with this brief example that one is no more superior then the other, but more importantly one could not function without the other. The same is the case with our two energetic aspects. 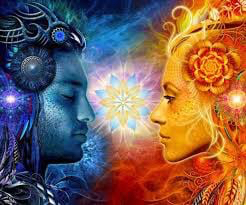 The masculine and feminine are both equally important and can not function completely without the other. There is no hierarchical or superiority to either of these aspects and although we have followed a train of thought that have indicated that the feminine for some time has been superceded by the masculine energy, in truth this is not possible from an energetic perspective. In truth, I feel, all that this is doing is perpetuating the out of kilt balance we are currently experiencing in our reality. Our illusionary reality is our perspective of our interpretation of the Ultimate truth which is played out on a electromagnetic screen (for more on this see 'what is multi dimensional reality' blog). In ultimate truth and our true reality these two aspect are completely balanced and united, they can be no other way for us to be here in existence. The Divine Feminine aspect is a true gift from Gaia, our divine mother, it works with cycles, flow and balances the natural elements of our beauitful planet. Gaia is our true teacher and ultimate guide when it comes to the feminine aspects, she grounds us, show us how to harness our intuition gifts and shares with us all her beautiful natural gifts from nature. The feminine aspect is also linked with the moon and it's cycles, crystals and anything that is linked to our beauitful mother. The Divine Masculine aspect is a true gift from our Sun, our great central sun, our divine father, it works with energy, divine power and action or movement. Great Central Sun is our true teacher and ultimate guide when it comes to masculine aspects, he elevates us allowing us the frequency to work with our galactic families, is our power centre and also our analytical mind, which when balanced and working for the highest good, is an essential tool for us to take action and make balanced decisions. Our Sun gives us opportunity to move forward in our lifes. The great Eastern cultures have long taught the wisdom that for peace to return to our beloved planet these two aspects need to be brought back into utimate balance, and it certainly feels like now is the time of bringing that harmony into our reality. We need to start this process by acknowledging each aspect within us, nurturing and empowering each with equal energy. This action individually will ripple out collectively and allow the shift to be made for the great good of all. As always, I would encourage you to feel in with your heart with all my sharings, take what resonates and leave the rest.